Stephanie: What's your name and title? Todd: Todd Nightingale, Senior Vice President and General Manager of Cisco Meraki. Stephanie: What are you doing in your role right now? Todd: Over the past few years at Meraki we've been really focused on growth. Meraki has always brought a simplicity value proposition to networking and now, more and more, we're expanding our focus. We no longer provide just simple networking – we are delivering simple IT. We've been building a platform that more people around the world can use to simplify their infrastructure. We are growing into new geographies and verticals, as well as finding new channels to market like service provider and global integrators. As part of Cisco, we've been lucky to be able to embrace all the power of Cisco technology. But our goal has always been to simplify powerful technology so that our customers can focus on their real mission. By simplifying the technology that they need for their business, our customers can focus on what matters most to them. Stephanie: What does intent-based networking mean to you? Todd: Intent-based networking is really about being able to manage your network with as close to your intent as possible, and in a much more simplified way. It's about removing complexity. Intent-based networking is shortening the gap between what I mean to do and how I do it. That's why we don't use sophisticated acronyms, we don't use CLI, and we don't require lots of training and certification. The vast majority of Meraki networks can be managed quickly with just a few clicks and with a lot less sophisticated expertise. Cisco's intent-based networking efforts are near and dear to the Meraki message. 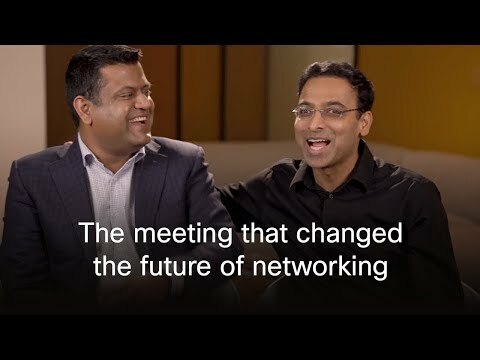 We've always been driving this concept of simplicity, and intent-based networking is about bringing that model not just to Meraki but to the whole of Cisco's networking portfolio. And the intent-based networking initiatives at Cisco have been awesome because I hear all of my peers embracing a simplicity value proposition, which I think is great for customers around the world. For those who might have traditional Cisco products in some sites and some Meraki products in some branches, we have integrated very closely with DNA Center so those network administrators operating on both platforms can have one single pane of glass to monitor their entire infrastructure. Stephanie: Where have you seen changes in Meraki in the last three years and where do you see it heading? Todd: When Meraki was acquired, it was about a hundred-million-dollar business, and now we're growing into a multibillion dollar business. We crossed the billion-dollar threshold last year and we're continuing to grow at an incredible pace. because of our growth, we are starting to make an enormous impact on the networking industry. For me, that's the most important part. As of just last quarter, more than 100 million client devices connect to Meraki networks every single day. Customers understand that simplicity doesn't mean basic. Simplicity can be powerful, and that's the best way to drive mass adoption. Customers are now forcing the industry at large to value simplicity, they're forcing our competitors to have to react– to have to answer the question "Why isn't your product as simple as Meraki?" We're starting to change the industry and in a lot of ways, that's what I'm most excited about—changing the industry and driving a simplicity value proposition through all of IT. This year, more than 100,000 customers will buy Meraki products. And that milestone is pretty important to us because it means we're reaching new customers every single day. They are perhaps starting with one part of the portfolio, like wireless or switching, but once they experience the simplicity of dashboard, they are able to easily transition more parts of their business over to the Meraki platform. We rely heavily on our customers to be our advocates. Stephanie: What does the future of networking look like for the distributed enterprise? Todd: Meraki is the future of the distributed enterprise. I believe that when enterprises become more highly distributed, simplicity matters even more. We see customers with mulitple sites that have little resources and little expertise, and things need to be managed remotely. Things need to be installed and provisioned with limited expertise on site. That's when simplicity matters the most. And I think we'll continue to see that trend. We're embracing that at Meraki by investing in technology for the branch. We've invested in SD-WAN, in an enterprise camera portfolio (the Meraki MV), and it's why we continue to keep the distributed enterprise in our sights across all of our product advancements. One important thing in bringing simplicity to the tech infrastructure market is this idea of a single pane of glass managing one single system. That's why we've taken Meraki—which started years ago as a wireless solution—and moved it to be a networking solution and now an IT infrastructure solution. That transformation is customer-driven. These customers use one product and see that simplicity and the value of Meraki dashboard. I think that's going to be the story of Meraki growth going forward, continuing to expand the portfolio and continuing to give people a single pane of glass for even more of their infrastructure. The industry has changed quite a bit in the last four or five years since we've been a part of Cisco. Artificial intelligence and machine learning are changing the landscape. Today, a simplicity driven system can't exist without true intelligence built into the system. That's why over the last 18 to 24 months we've really been driving this concept of embedded intelligence, deep intelligence. It's embedded into Meraki products to give customers a much smoother experience by proactively finding problems and prescribing the cure. I think Meraki Wireless Health is our best example. It's all about giving people the best possible wireless experience using AI, because our networks can do more for us—they can help diagnose when we're sick and prescribe the cure. That type of AI built directly into the products—not as an extra license—but embedded deeply into the product, is the key going forward. That's why we're investing so much into artificial intelligence and machine learning at Meraki. Stephanie: What's on your desk? We started giving away socks to channel partners who were selling a lot of Meraki products. We first started with an order of 250 socks, and it has become the most popular piece of Meraki swag by far. Now we have a series of socks we've made, we make thousands of socks per quarter. It's the most appreciated gift we give customers, partners, or employees around the world. I have at least one pair of each Meraki sock that's been made and because of that, I wear them a lot. I have three mugs at my desk by accident. Usually, when I pass the coffee machine at 2PM I forget there's a half-drunk cup on my desk, so I wind up with another. What's real is real. On the other side of my desk is a book called Radical Candor. That is the book I have given away the most copies of. I've read it a couple of times now, and I think it's an awesome way not just to learn how to receive feedback better but to build a culture where everyone give and receives feedback more effectively. That's a book my head of product management Raj Krishna just gave me the other day. He is convinced it's going to help us all default to action and increase productivity among the Meraki leadership. Women of Meraki was our first employee resource organization at Meraki. It has been going strong for three years now, and it's awesome. Across all of tech we really have to face the reality of the number of women who join and stay in the industry. It's a priority for Meraki that we do everything in our power to build the most inclusive and most diverse community possible.